Making handmade lace is a time consuming process, it can leave you frustrated and wanting something faster, with as beautiful of a result. Hairpin lace is the answer you are looking for. Easy to do and versatile in nature, hairpin lace can make all sorts of garments, from shawls to blankets to dainty edging on table runners. You will love the finished look, and you can find lots of free patterns online. Easy instructions and simple patterns are set out below to help you get started in this beautiful craft today. To make hairpin lace, you will need a crochet hook and a special hairpin lace loom. These come in a couple different kinds. The simplest is a piece of metal bent into a hairpin shape. Another type is adjustable and has two parallel rods, fitted at the end into plastic strips which are holed at intervals. The size of both kind of loom will depend on the thickness of the yarn, the thread that will be used, and the item it is being used for. Basically, to make hairpin lace, a thread is wound across the two prongs of the hairpin loom, then crocheted to the one beneath it in the middle. 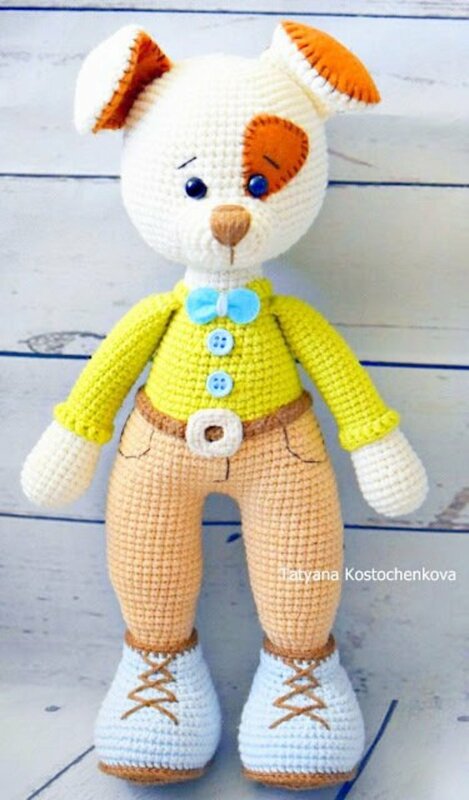 Simple or intricate designs of crochet can be used. 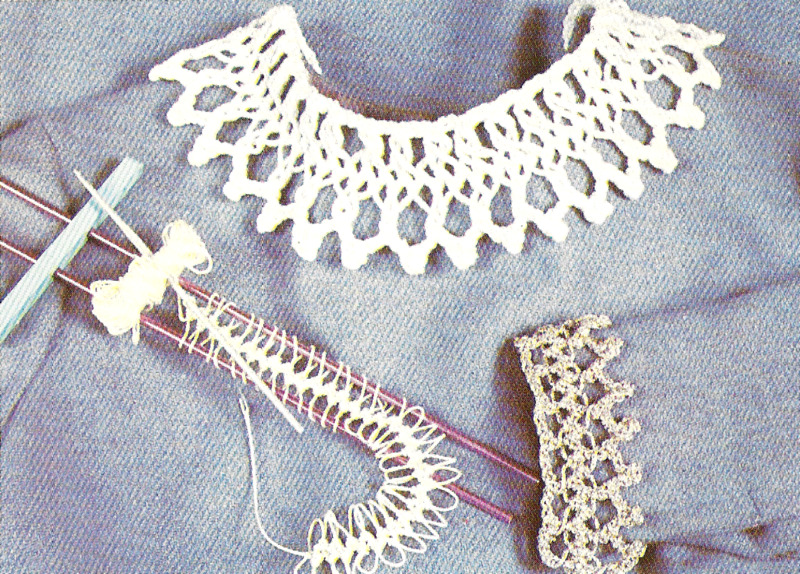 When the hairpin lace becomes overcrowded, most of the loops are slid off, and the work continues until the strip is the desired length. 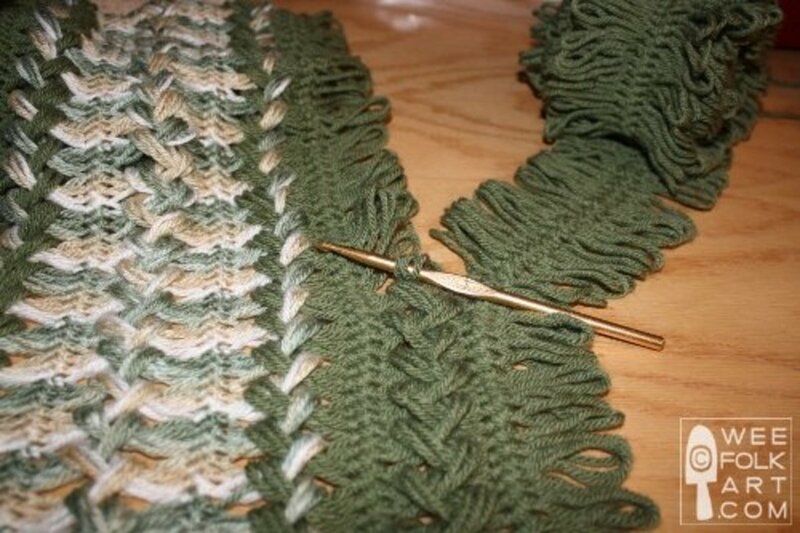 The strips are then joined together, using the crochet hook to draw loops of the two pieces to be joined through each other. The outer edges are finished by drawing the first loop through the second, the second through the third and so on. Hairpin lace is only started on the loom. Hairpin lace strips are used to create a multitude of beautiful items, it's how you work with them that determines the finished product. Although it might look complicated at first, using the hairpin lace loom is a really simple process. To start, make a loop at the end of the thread and slip it on the crochet hook. Hold the loop between the prongs at front of work. 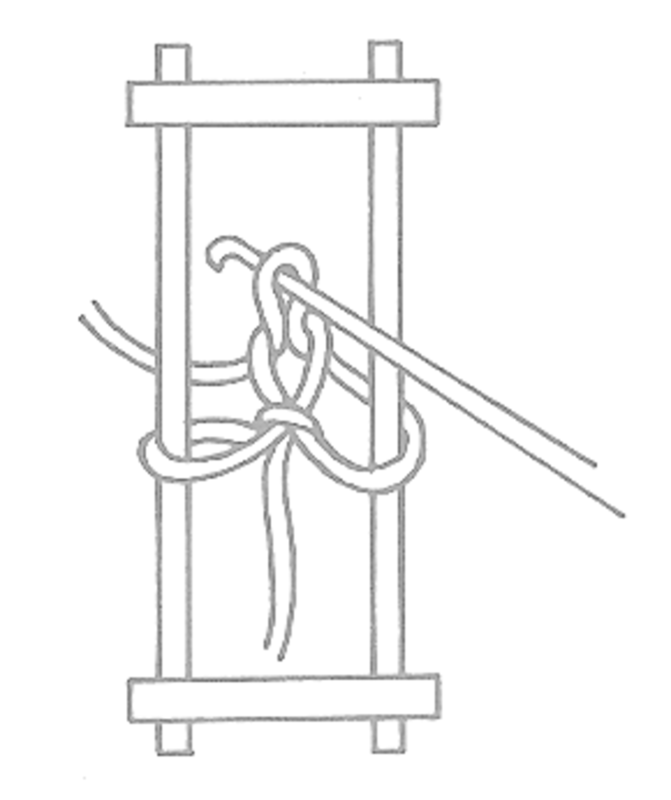 Pass the yarn around right-hand prong, over hook and draw a loop through the loop on the crochet hook as shown in Figure 1. 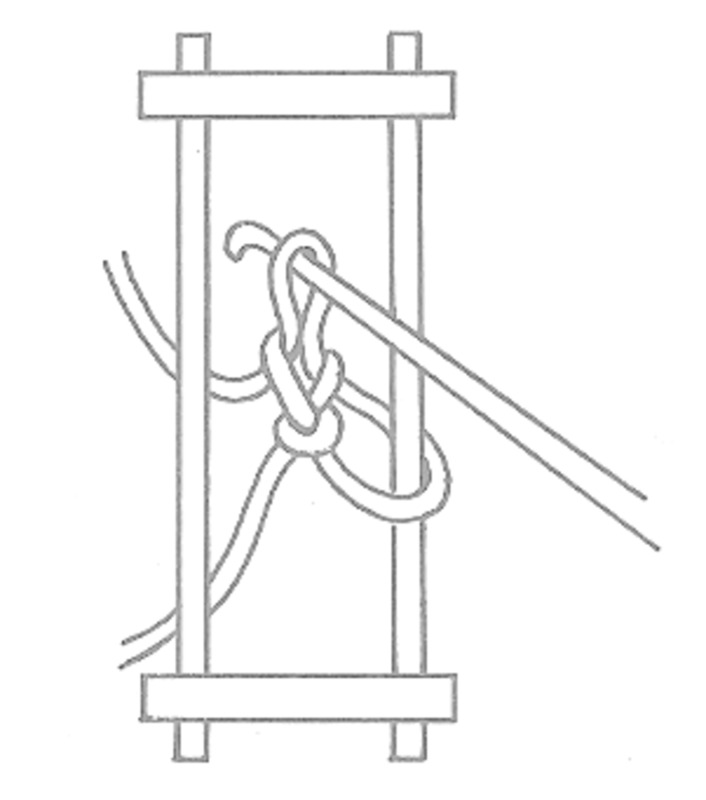 Turn prong half a turn to the left, pass yarn around second prong, yarn over hook as shown in Figure 2. 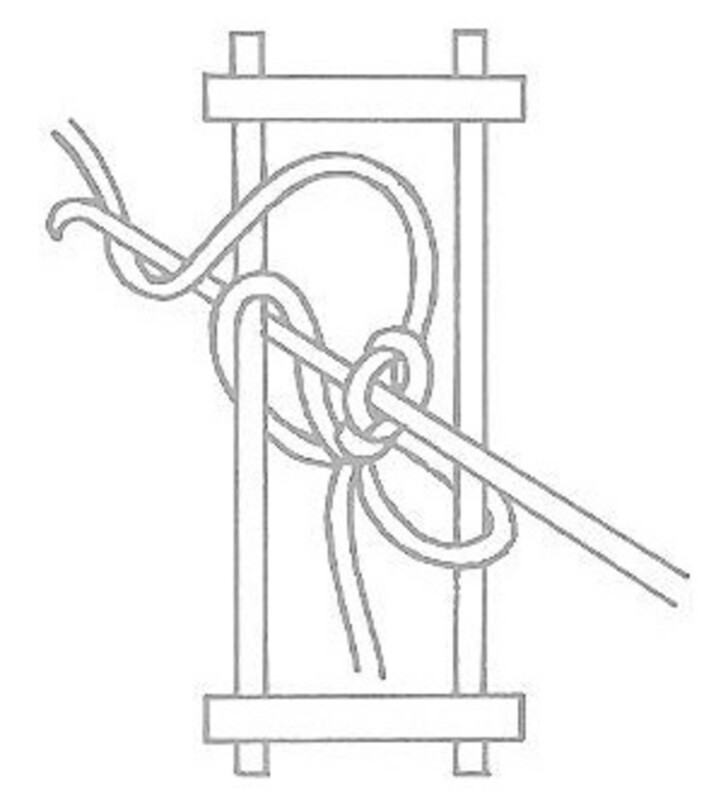 Draw a loop through loop on hook, see Figure 3, making a loop around each prong to complete the turning movement. Continue working in this way, one single crochet into the front of the loop on the left hand prong, shown in Figure 4. When the loom becomes over crowded, remove the bar at the bottom of the loom and slip off most of the work, just leaving a few loops, and continue on as before. On a loom without a movable bar, slip all the loops off and then replace three or four of the loops that were just worked. Finish each strip by cutting thread and drawing it through stitch on crochet hook. Lay two strips out, side by side on a flat surface. 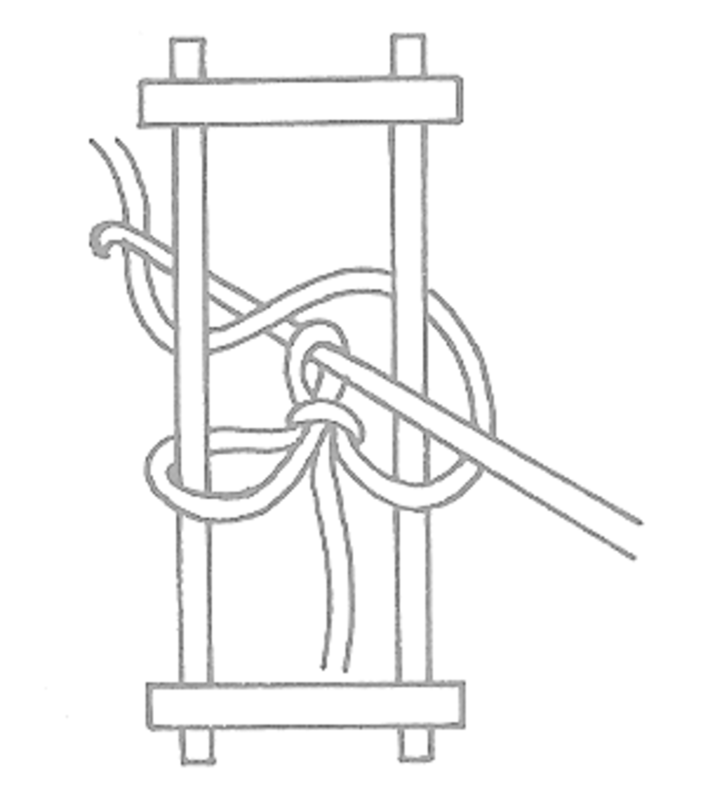 Using a crochet hook, join them together as shown in Figure 5. This is called one-to-one joining. As you see in the diagram the 'twist' has been taken out of the loops. If you want to leave in the twist, it can look just as nice. Just make sure that each loop is twisted before you insert the crochet hook for the one-to-one joining. When you have finished joining two strips together, secure with a piece of thread and sew neatly into place. A simple way to finish off your side edges is to just insert the crochet hook into a loop at one end, draw this loop through the second loop, the second loop through the third and so on. When you have finished, secure the last loop with a piece of yarn and sew neatly into place. Or you may finish off by drawing the loops in pairs through each other. It depends on what you are making or what your pattern calls for. Get comfortable with the loom, learn how to keep your tension even, and your line in the center. Then, quickly move on to lovely patterns that catch your eye, and make your new found talent shine. Set the sides of the loom 1 inch apart. Work a strip of hairpin lace with half double crochet in the center. This pretty much covers the basic instructions. Simple edgings are great to get started with, they are easy and can add elegance to a basic garment. 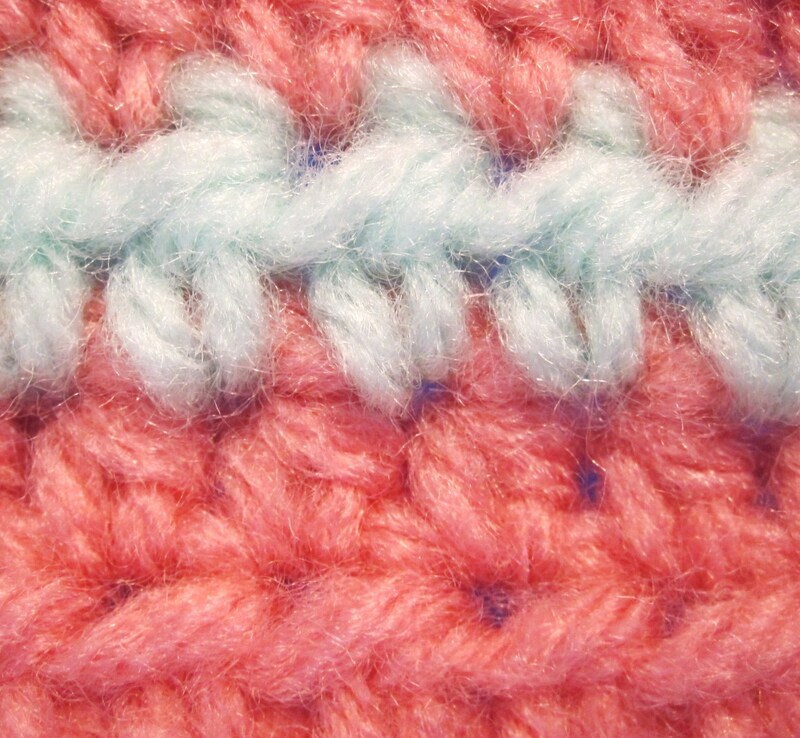 If you aren't familiar with basic crochet stitches, or you need a refresher click here. 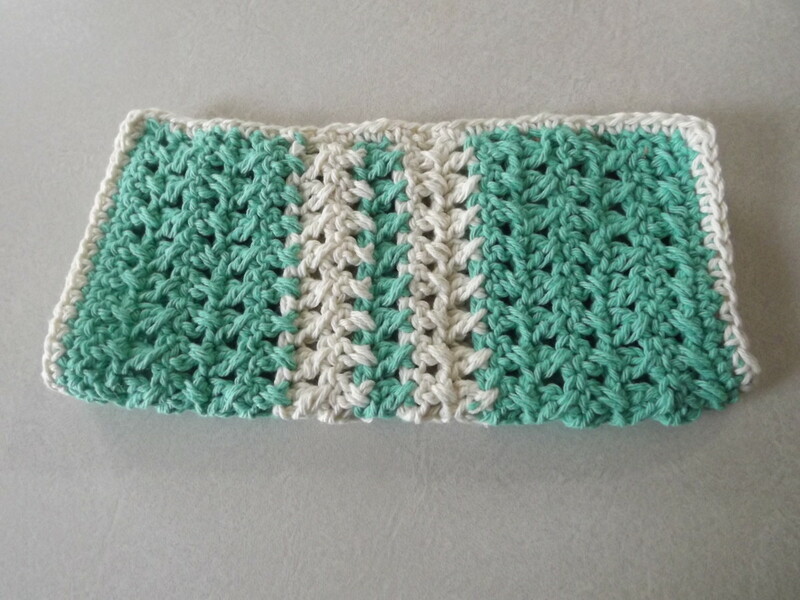 Keep reading to find simple edging patterns and more links to free patterns. This is a basic pattern for a cuff, it is just the right size to get you started. The picture doesn't do the gold thread justice, but the pattern is the same, something simple to help you get comfortable. Each cuff measures 9 inches around the edge. Set sides of loom to 1 inch apart. For each cuff work twenty-eight loops on each side of loom with single crochet in the center. Remove from loom and keeping the loops twisted, work the edging. Edging: Attach the thread to the first two loops together, then *ch 5 s.c. into 4th ch. from hook, 2 ch., s.c. into next 2 loops together. Repeat from * to end. Fasten off. Heading: Attach thread to first two loops on opposite side, then *ch 3, s.c. into next two loops together. Work the other cuff trimming in the same way. This pattern is the collar in the picture above, with the golden cuff pattern. The finished collar measure 14 inches around the neck edge. Set the sides of the loom 2 inches apart. 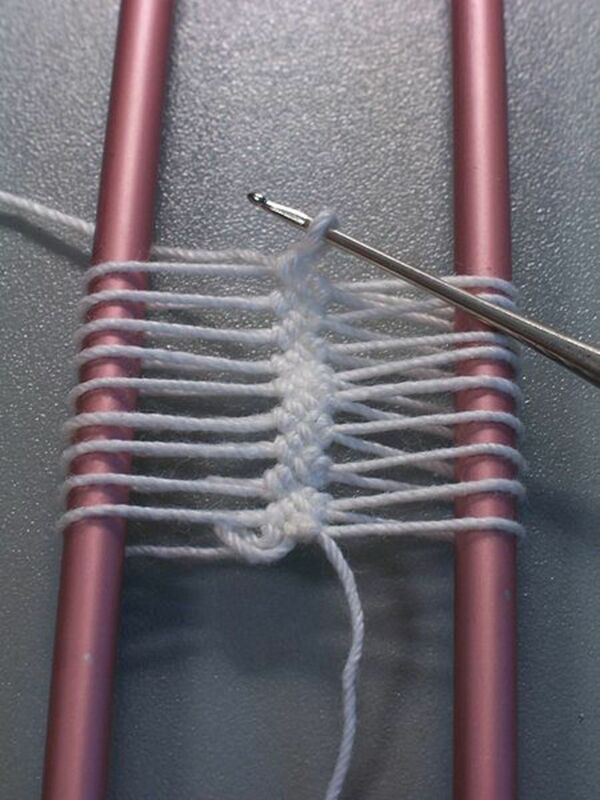 Work a strip of hairpin lace with single crochet in the center until you have forty-eight loops on each side of the loom. Remove from the loom and keeping the loops twisted, work the edging. Edging: Attach thread to first two loops together, then *ch., s.c. into 4th ch. from hook, 2 ch., s.c. into next 2 loops together. Heading: Attach thread to first two loops on opposite side, then * ch 2, s.c. into next two loops together. This is a very dainty hairpin lace edging, worked on a narrow loom, with a thin crochet hook and fine thread. 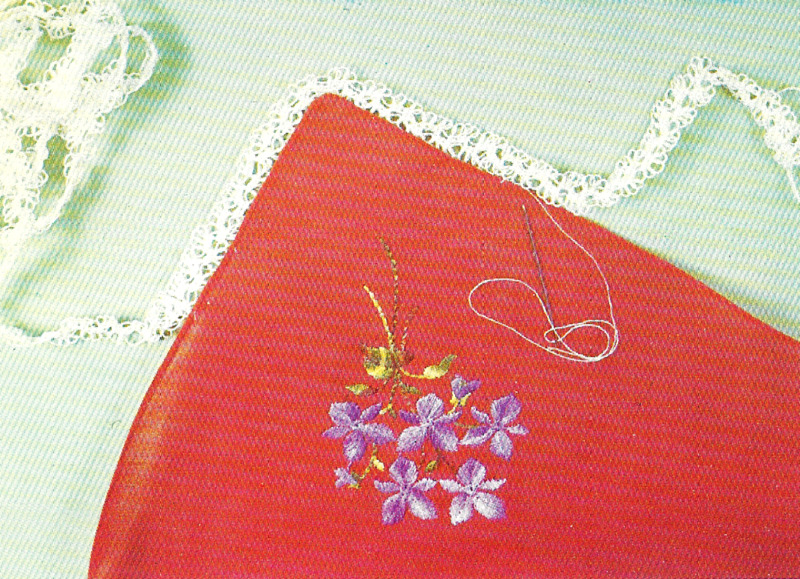 The picture shows the edging done on a handkerchief. This is a great way to start practicing your edging. 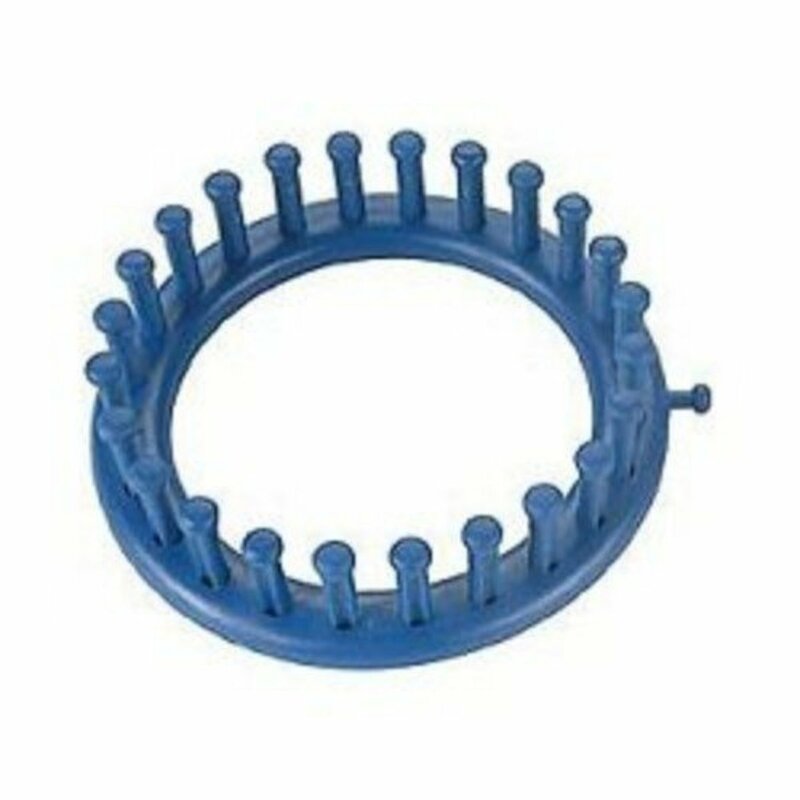 Repeat from * to ** twice more until you have foundation loop and three more loops on the right hand prong. Turn prong so that left hand side is now right hand side. Repeat from * to ** three times as previously. Empty the loom when overloaded. Carry on working in this way until you have made the strip long enough to go all around the handkerchief you wish to trim. Remember to make enough to comfortably go around all four corners. Finish off by cutting thread and drawing it through the last loop on the crochet hook. Sew neatly into place. Carefully ease lace into position all around handkerchief and pin into place. Using the sewing thread and a fine needle, sew very neatly to the edges of the handkerchief, being careful to keep it flat around corners. 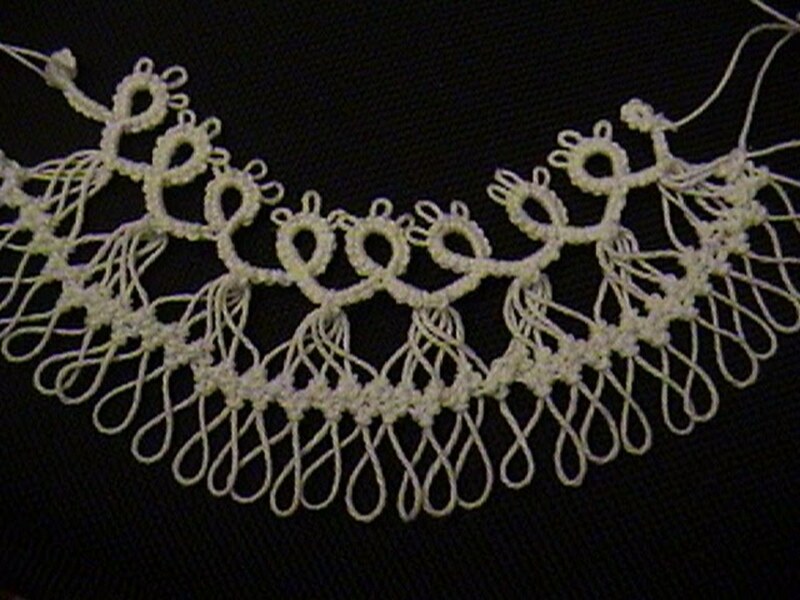 Hairpin lace edgings trimmed with crochet are especially beautiful. Work a piece of hairpin lace the required length with single crochet in the center. Keeping the twist in all the loops, work a single crochet down both long edges. * 3 d.c.in first space between loops, chain 3, 3 double crochet in the same space. Skip three spaces between loops and repeat from * until you come to the end of the hairpin lace. Remember to make two shells at each corner. 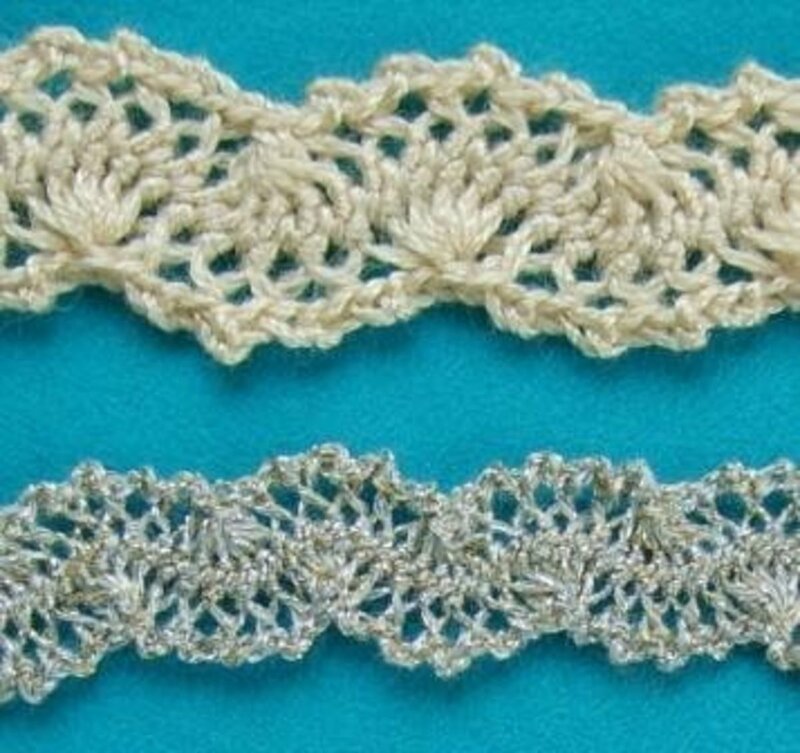 Try experimenting with various crochet stitches on strips of hairpin lace. 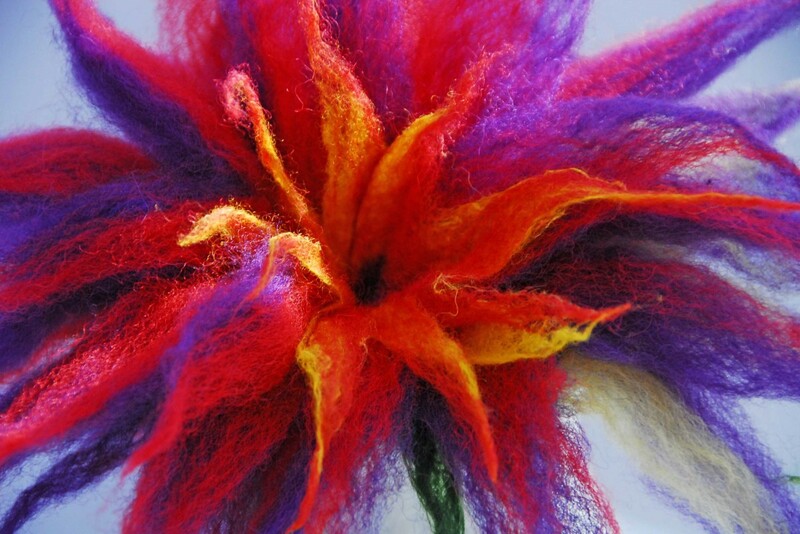 Also try working with all kinds of different threads and yarns, using appropriately sized looms and crochet hooks. In this way, you can make trimmings for anything you wish. Add some new bling to your hair with this easy pattern. Lacey and lovely, the perfect final piece to that fabulous outfit. This lovely lacy pattern will add a touch of elegance to that plain skirt. Warmth and style combined to make that perfect outfit. I find with most things, the best way to learn is just start doing it. It might look complicated on the screen, but once you do it, following each step, it becomes very easy. A wonderful job. Super helpful inmrofation.